Deadline is the beast that journalists vroom against, resulting in many a slip between the satellite and the computer in IT city. This entry was posted in Kannada & Karnataka, Media, Tongue In Cheek and tagged Churumuri, ISRO, Sanje Vani, Sans Serif, Wipro. Bookmark the permalink. No offence but what editorial brillance can one expect from Sanjevani ? The same newspaper once wrote that DRDO is an IT company and CNR Rao is an IT engineer! As Andy says what editorial brilliance can one expect from Mallappa and Mrs. Hiremath of Sanjevani? Mistakes do happen- Newspaper is not like a blog which can be edited after publishing-Once printed and circulated the error is permanent- did anyone check if they’ve issued a clarification in a subsequent issue? This is not new. Everytime a software engineer is injured or killed , Sanjevani usally runs the headlines something like ‘Software killed’ or ‘Software injured’. I’m not surprised. ಶ್ ನಿಧಾನವಾಗಿ ಹೇಳಿ. ಸಾಹುಕಾರ್ರಿಗೆ ವಿಷಯ ತಿಳಿದಾಗ ಗರಮ್ ಆದರು. ” ನಾವಲ್ಲಿ ವಿಪ್ರೋ ಮೊದಲೇ ಹೋಗಬೇಕು. ಪೈಗಳೇ, ವಿಪ್ರೋ ಚ೦ದ್ರನಲ್ಲಿ ಜಮೀನು ಕೊಳ್ಳುವ ಮೊದಲೇ ನಾವಲ್ಲಿ ಹೋಗಿ ಚ೦ದ್ರನಿಗೆ ಬೇಲಿ ಹಾಕಿ ಬಿಡಬೇಕು” ಎ೦ದೆಲ್ಲ ಎಗರ್‍ಆಡಲು ಶುರು ಮಾಡುತ್ತಾರೆ. 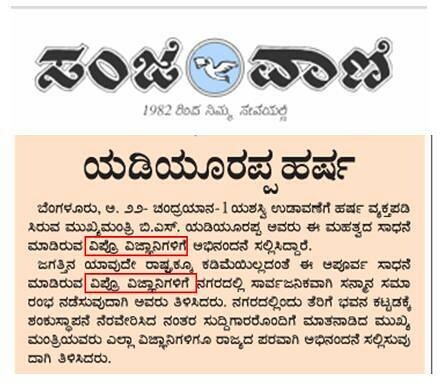 Don’t they claim the distinction of being first newspaper from Karnataka(India too?) to have a website!? Is an oxymoron, like ‘living dead’ or ‘clever fool’. I am even inclined to think that the reporters were factual and the mistake was from Yeddy. He probably mistook WIPRO for ISRO. It rhymes isn’t it. Quite a possibility. Wipro did have a division which catered to the needs of ISRO/DRDO in the 80’s(though I am not sure if it still exists). It did contribute significantly to the ISRO projects then as a major vendor. However, I am not sure if it did have any role in Chandrayan. hey, could you guys put your pictures on wordpress and not on flickr? flickr is blocked at many workplaces and so we get the text but not the images… WP offers 3 GB space…. make use of it. When it comes to our CM Yeddy, anything is possible. Till recently he didn’t know the difference between Catholics and Protestants! It may be just possible that yeddi assuming that the chandrayana was organized by WIPRO. why blame the newspaper. Whether it is WIPRO or ISRO it is all the same for both Yeddy and Sanjevani. What did Wipro vend to ISRO in 1980? Shikakai Soap? This country simply doesn’t care for its scientists! ISRO Scientists compete with the best space scientists in the developed world and get 1/10th of an American scientist’s salary and get 1/2 the salary of an Indian IT worker. That’s why when you say ISRO people will always hear it as WIPRO, which is more popular, because money commands respect among them. And yes, Sanjevani does have a website – has been on for over ten years now – and definitely was the first ‘language’ newspaper on the web – it’s not merely a claim, it’s a fact. P.S. I realize I’m about six months late in commenting on the post, but I happened by it just now.